Business fundamentals and relations in the car industry. sheet, whose composition and structure are analyzed. The participants get in touch with fundamental principles of business management in a playing way. They understand the principals practically which is better than theoretical learning. 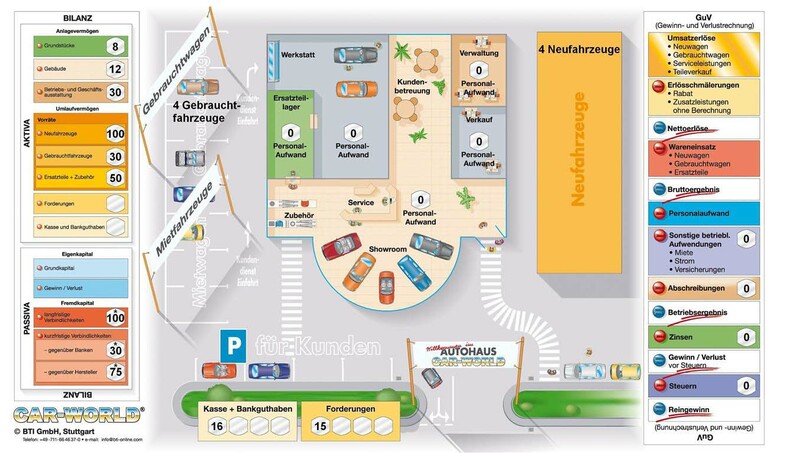 Already during the set-up of the business simulation, the financial dimension of a car selling business becomes clear by the allocating of the coins to the different positions of assets within the business. In Car World the participants experience a value added connected to interdepartmental barriers and discuss ways to improve cooperation and customer satisfaction.